Ciao a tutti (Hello everyone), from beautiful downtown Milano! As we shared with you last time…Karen and I have taken over the young adult ministry and we are having a blast with these international students and professionals. 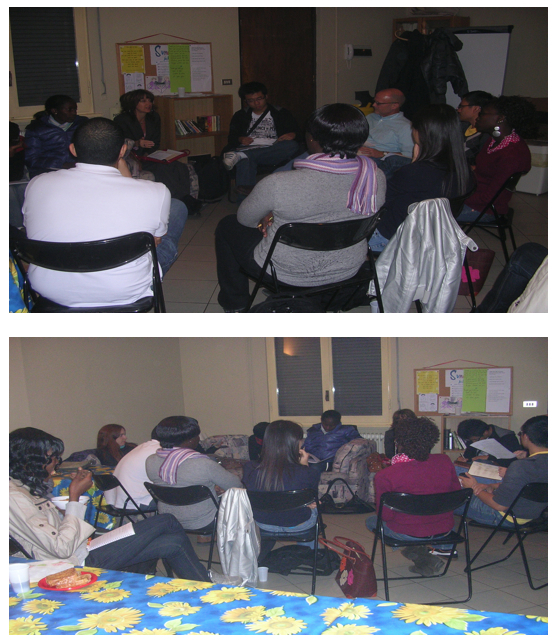 Below are a couple of pictures from a recent young adult Bible study. In this small group we have young people from Canada, Philippines, Uganda, Ghana, Nigeria, China, Kenya, Egypt, Brazil and America. It’s been our experience that many of these young people have had some exposure to Christianity, but often the teaching they’ve been exposed to has been superficial or just downright heretical. It’s such a blessed privilege to simply open the Bible and challenge them to hear what our awesome God has truly said…I have to say, it’s just so much fun to watch God turn the lights on! The Lord has once again graciously provided for us to fly home this year for the holidays…This is a sweet gift to us that we may see our parents, children, and ever-increasing number of grandchildren…As well as, many of you. Yes, we are available to be taken out to eat a lot…Yeah…I know you take, BBQ ribs, greasy cheeseburgers, onion rings, catfish & Mexican food for granted…We don’t! We praise the Lord that He has again provided a place for us to lodge while we are in Little Rock! We are continuing to pray for the use of an automobile while we are there. Please let us know if you are aware of a vehicle that might be available. We fly into Little Rock December 14 and fly out January 6. 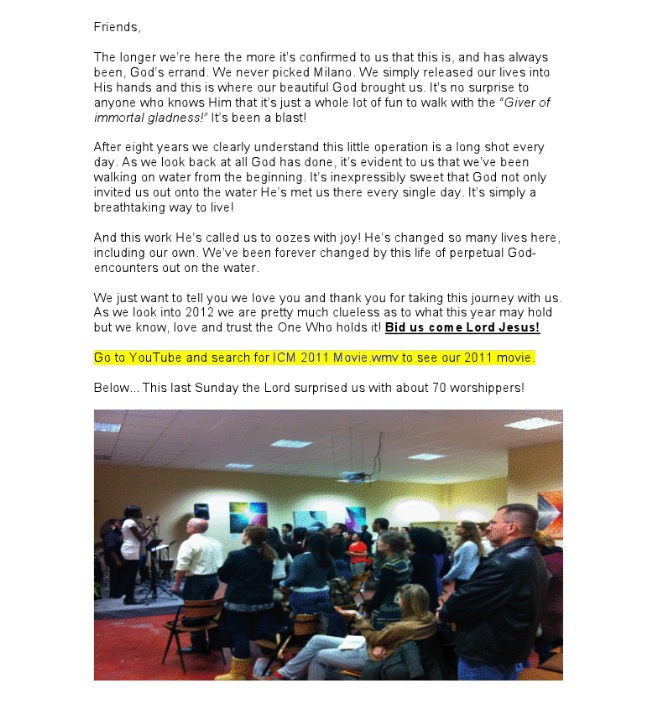 We love you…Thank you for your continued prayer and financial support! God continues to “turn the world upside-down” over here…One life at a time! Ciao amici! Grande notizia da Milano! (Hello friends, Great news from Milan)…Karen recently had her semi-annual battery of tests and scans…AND…Yes, the oncologist says everything looks good! We are so humbled by and so thankful for God’s ever-faithful, attentive goodness to us in every sphere of life! Who is a God like ours? Yeah…You know…There ain’t none! As most of you know, Tyler & Jessica Stewart from Kansas City, Missouri came over in January of this year to handle our music and young adult ministry. For personal reasons, they have decided it is best for them to return to the States in the coming weeks…While we are thankful to have them and will definitely miss them, we are excited about how God has equipped the Body to handle this unexpected change. We have three gifted young men in the congregation who are going to work together to lead our worship…Below is a shot of the worship team from last Sunday…From the left…Yes, that’s my beautiful wife & Tyler from America, Maryse from Canada, Chinelo from Nigeria, Renel from the Philippines, Orazio from Italy and Heidi from Denmark. Renel, who sings beautifully, plays guitar and can really, really, I mean really, bang a jimbe, will be assuming leadership of our music ministry. 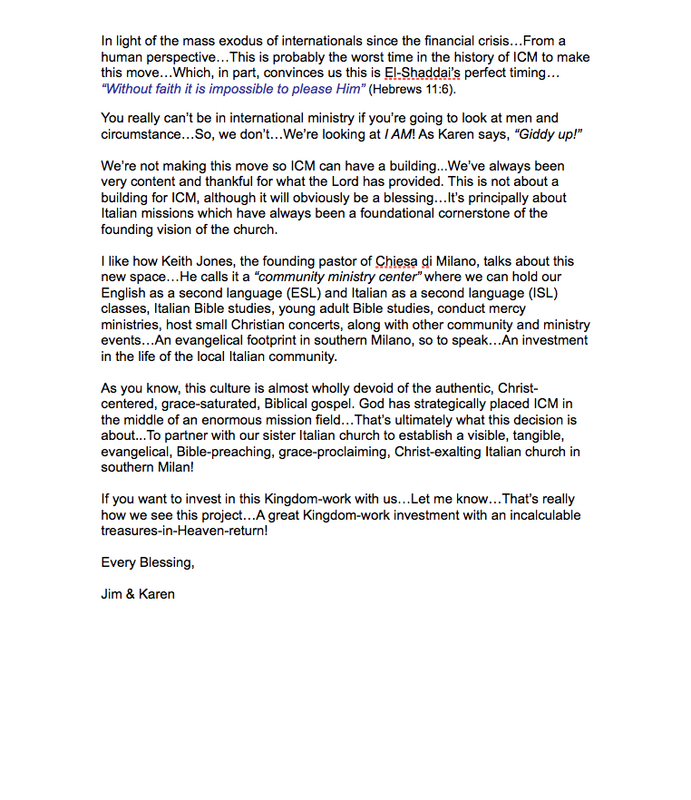 Karen and I, along with Kelvin, a young man from the Philippines, will assume responsibility for the young adult ministry…Karen & I used to do this work and in all honesty we have missed being more involved in the lives of these young people from all over the world…We are genuinely excited! Every fall is a whole new season in our church…We lost about 50% of the church to repatriation over the summer, so we are beginning to rebuild…Join us in praying that the Lord will draw many to Himself through ICM! Friends…The month of May was way too much fun! Our Father is so gracious to us! 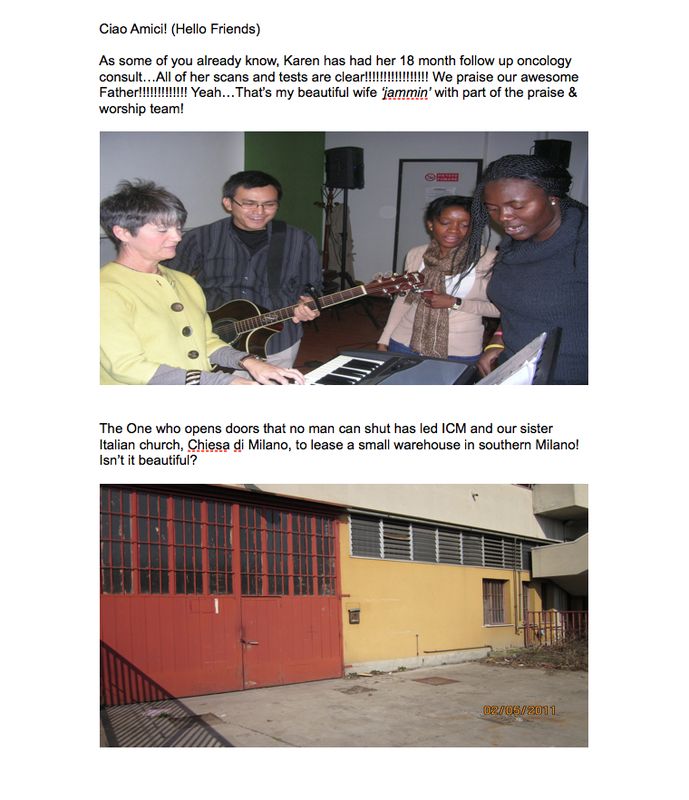 The Lord allowed me to preach in a new Italian church plant a couple of hours east of Milano…Our church is coming alongside this new work to provide prayer and financial support along with fellowship, counsel and encouragement…It’s called the “Grace Alone Church”…A great contrast to the false church that dominates this nation. 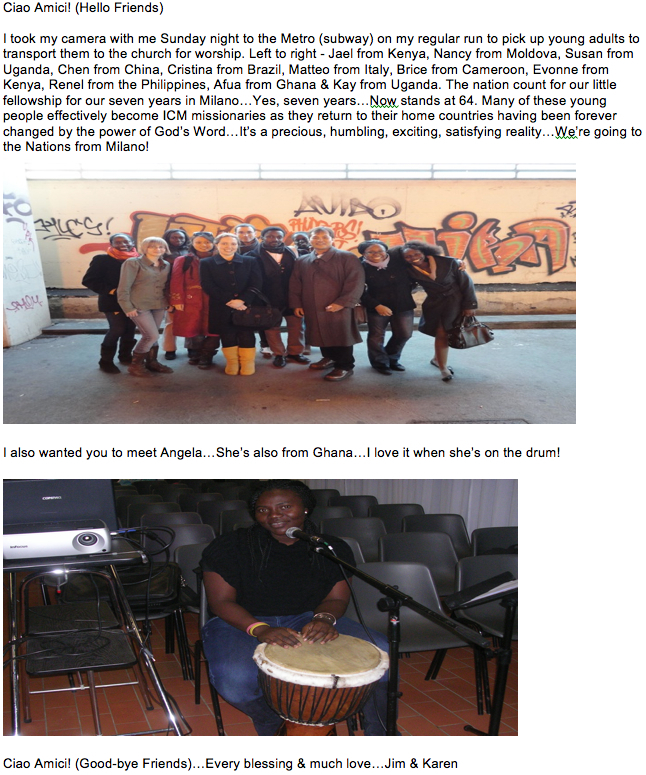 Karen was invited to be the keynote speaker at an women’s conference made up of 60 Italian speaking women doing evangelical ministry in southern Italy…She traveled to the extreme southern tip of the Italian peninsula to challenge the women to persevere in deepening their relationship with God as they persevere in their ministry. Also this month…Pictured below…The Lord blessed our church with yet another great annual women’s retreat… We had a little over 60 women from about 15 different nations for a long weekend in Varese, Italy. Once again, we simultaneously translated all the sessions into Italian for the good number of Italian women present.